Tales are whispered to young elven babes about the Fallen; Elves that have taken the path of darkness by bathing themselves in dragon blood. 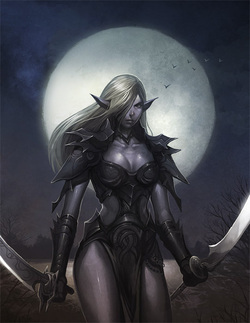 The Fallen are the small group of elves that have rebelled against elvin culture, choosing to slay any dragon they find instead of revering it as a god. This has led them to be outcasts, stricken from elvin society and banished from the Elvin Lands forever.